California Pacific Laboratories, Inc., dba CP Lab Safety, is a manufacturer of environmentally friendly laboratory safety products and supplier of more the 12,000 lab and industrial products serving Pharmaceutical and Biotech companies, universities, Oil and Energy and Aircraft Industries and Government Laboratories, nationally and internationally. The company's headquarter is located in Novato, CA and the line of over 80 products manufacture in Santa Rosa, CA within 45 minutes distance from its office. 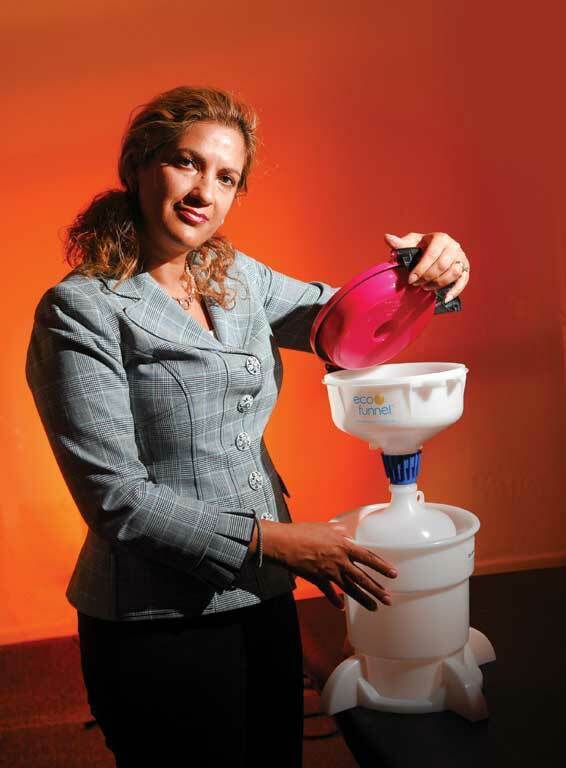 The company started in 1996 with an innovative product, called Eco Funnel. CP Lab Safety is a small, woman owned business that employees 7 full time and 3 part time employees, in sales and marketing, web management and customer service and accounting and shipping and handling in its office in Novato, and sells through a network of distributors around the world, including China, Korea, Japan, Taiwan, UK, Israel, Spain, Canada and the United States, and additional independent contractors in engineering and manufacturing. CP Lab was founded by my husband and me in the basement of our house in San Francisco, based on my husband's (Ron Najafi) invention. Ron is a Ph.D. chemist who continuously is looking for ways to make life easier, safer and healthier for everyone and is now the CEO of a major pharmaceutical company called NovaBay Pharma (NYSE-NBY) located in Emeryville, CA, with over 60 employees. Ron and I decided that we could make a business out of this product and promote it to other companies in similar situation. On March 13, 1996, Ron left his full time employment with Applied Biosystems as a senior research scientist to begin manufacturing the funnel and marketing it throughout the US and the world. We had just started to have a family and our first daughter was less than a year old. I would help Ron in between feeding the baby and taking care of the house and of course his enthusiasm was contagious and I began to see what he saw in the product and it's potential. In 1996, we took a sublease space in Novato, CA and hired one other employee and began marketing the product in the USA. The simple idea of a funnel with a lid which reduces the chemical vapor from getting into the labs, at the beginning , was a joke to many chemists and lab mangers. "Why should I pay $100 for a plastic funnel with a lid, while I can evaporate the chemicals into the air for free?" was the question we heard from many chemists and biologists. We were disappointed, but on the other hand, very encouraged to approach the companies that cared about the environment such as EPA. We presented the simple funnel with the lid named ECO Funnel to EPA, and received an order for 100 of ECO Funnels from several of the EPA labs. This was a big accomplishment for us. Soon after, we received several orders from the pharmaceutical companies mentioning that the lab inspectors suggested the use of our ECO Funnel in their labs. Pouring the hazardous chemicals into the sink or evaporating it into the air became EH&S violations and there were fines associated with the failure to comply with the regulations. The enforcement from EH&S people to use our safety products along with strong marketing campaign around the impact of chemicals on our health and the environment helped our business to growth tremendously. We moved manufacturing to China in the year 2001. Our contract engineer, who helped with the 1st design of the ECO funnel, recommended that we move the manufacturing, because it was very expensive to manufacture injection molding tools in the USA. For 7 years we made our ECO Funnels in China and expanded the range of product to 80 different models. I (Kelly, Farideh Farhangi-Najafi), officially took the helm of the business in 2003 and became the President and CEO, when Ron moved on to form his pharmaceutical company in Emeryville, CA. I took a portion of my salaries in shares and now I own 63% of CP Lab Safety. We registered the business as a "Small Business", and a "Woman Owned Company," and also got on GSA schedule for Laboratory Equipment and Supplies. This was a big accomplishment and CP Lab Safety started to become a supplier to the government agencies, such as California Department of Public Health for most of their laboratory needs. We moved manufacturing back to the USA in 2007. I brought the manufacturing of all our ECO Funnels back to the USA. It had become cost prohibitive to manufacture in China. The cost of goods had risen to double what it was in 2000 and the cost of shipping had gone through the roof. By moving everything back to the USA, we got a “Made in USA” label on all our products and we were in better control of quality and our overall manufacturing cost went down. The press release regarding bringing manufacturing back to U.S. got media's attention, and I had several interviews with SF Chronicle, and several business journals inquiring about my decision. Chemical Engineering News published a 3 page article in 2007 and we were one of the featured companies. The title of the article was "On-Shoring Manufacturing Back to the USA"
San Francisco Chronicle article on overseas manufacturers losing their price advantage. April 2009 Press Release announces the return of CP Lab Safety manufacturing from China to the U.S.
We hired more people to help with distribution and marketing in our offices, not to mention we added at least 10 manufacturing jobs at our contract facility. Our ECO Funnel has been in use for the last 18 years and has helped reduce tons of chemical into the environment and also reduce exposure to people working with highly hazardous chemicals. Its use became mandatory in many well known pharmaceutical companies. Our team of dedicated, engineers, sales and marketing believe in our mission and vision and operate very efficiently. Our Mission: To keep people healthy & safe. Our Vision: To be the best safety company in the world. The key to our success is spelled out below. We invest in our team. We must look to continuously upgrade our knowledge. At CP Lab, whether our customer is internal or external, Customer is always King or Queen. Bureaucracy wastes time and money. Operations should be fast and simple! Look for ways to reduce waste and cost without taking shortcuts. Negativity only creates bad feelings. We should avoid being defensive when things fail. We will take calculated risks & be willing to stick our necks out and learn. We must demonstrate great communication, both verbal and written, and learn how to work with our colleagues. Always do the right thing and do what we say we will do. CP Lab is an energetic and creative environment where we develop and emulate new ideas and technologies. WHY WE ARE POISED FOR ADDITIONAL SUCCESS IN 2015 AND BEYOND? Environmental activism and the national psyche is leading us toward more conservation of the air, water and soil. People care more than ever about their health and safety as it relates to food they eat, water they drink and air they breathe. Our patented products and those that we have in our pipeline will help grow our business and lead us to our mission and vision. We are deeply passionate about being the number one company that is recognized within industry as caring about the environment and people's safety.